Surgical Instrument Washer Decontaminators and Washer Disinfectors that use the proper cycle treatments will consistently deliver the highest quality washing outcomes. The proper washing cycles perform ultrasonic cleaning that fragments soil, cold water pre-wash to flush the gross contamination, elevated temperatures detergent washing to remove soil from surfaces, purified water rinses with increasingly elevated temperatures, lubrication, and high temperature drying. Surgical Instruments cannot be sterilized unless all exposed surfaces are properly cleaned, prior to sterilization, to remove soil and properly rinsed to prevent staining. 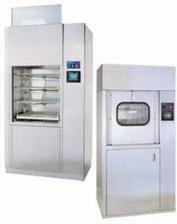 Not all surgical instrument washer disinfectors provide adequate pre-rinsing, pre-cleaning, purified water rinsing. Inadequate washing will render higher rejection rates and decrease the efficacy of terminal sterilization. For more information pursuant to the proper washing times and temperatures go to "washers properly designed deliver sterile surgical instruments". Surgical Instrument Washer Decontaminators and Washer Disinfectors have demonstrated that they can deliver sterile medical devices at the completion of the proper washing cycles.